The divide between smartphone and e-book reader can be rather thin in some cases and now, thanks to Yota Devices, that line is as thick as a mobile phone. 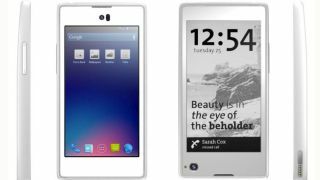 The company announced today the Yota Phone, an Android-powered device with a LCD display on one side and an e-ink electronic paper display (EPD) on the other. Both screens measure 4.3 inches, while the LCD side has a 1280 x 720 resolution (about 340ppi). "Technology is setting the tone of our lives rather than the other way around," Yota Phone's press release read. "We at Yota Devices aim to rebalance the relationship with our smartphone." The new smartphone looks to "help consumers enjoy life's virtual side without missing the real one" by juggling the two screens. The LCD side is for watching movies and playing games, but the EPD one is for more than reading ebooks and news articles. The black and white side automatically updates itself with news stories, social media updates, notifications, calendar entries and more. E-ink displays don't need much power, so that side of the Yota Phone can stay on continously without killing battery life. Yota also promised a host of apps to take advantage of the duel-screen set up and the EPD. The phone has a 1.5GHz dual-core Krait processor and runs Android 4.2 Jelly Bean. Its main camera is a 12MP lens, though it also has an unspecified "HD" camera on the front side. The Yota comes with a 2,100mAH battery and 32GB or 64GB of internal storage. It's a world LTE phone capable of connecting on the 3, 7 and 20 MIMO bands. In another design quirk, Yota Devices outfitted its first phone with a power button that doubles as a SIM card slot because, why not. The dual-screen smartphone is the first product from Yota Devices, a spin-off of Russian modem and router manufacturer Yota. Though this is the first phone from the new company, it claims the two-faced handset has been in development for more than two years. Many products have tried to redefine the relationship between users and their phones, and with its two screens and double-duty power button, the Yota phone brings some interesting ideas to the table. We honestly can't say whether consumers will take to a smartphone like this when it debuts - its due out to sometime in the second half of 2013 - or ever. Though Yota Devices hasn't released prices for the new device, the company said there's more on the phone coming during Mobile World Congress in February 2013.